I was so excited several months ago when I received a surprise box I wasn’t expecting. When I opened it, a delicious vanilla candle was nestled inside and it was from Aromatique. I was confused at first since I was sure I didn’t order it till the mystery was solved a week later… a marketing rep from Aromatique sent it to me to review. What an unexpected and fun surprise that was!! If you’ve read any of my past reviews, you know Aromatique is a big favorite of mine. I consider this company a luxury brand… and the best part, they’re priced mid range for luxury candles. They offer unique and signature fragrances that are super strong and pretty much every candle I’ve ever purchased have been room fillers, even their pillar candles. I usually purchase this brand locally so I can smell them first… that’s one luxury we don’t get very often these days, to actually smell a candle before purchasing it. But if you don’t have a store near you, you can purchase this brand directly through their website as well. Aromatique offers a nice variety of styles in each fragrance they carry including rooms sprays and potpourri which I LOVE LOVE by the way and I’m not a huge fan of potpourri. I have one piece of décor in a guest bathroom filled with potpourri and Aromatique is the only brand I use. It’s gorgeous, lasts a long time and smells so good. Okay, onto my review of Pure Vanilla. My candle was very simple. I don’t know what style to call this jar – see picture above. 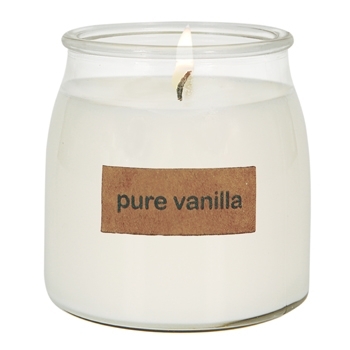 It was just a simple glass jar with a thick kraft label on the candle that simply says “Pure Vanilla” – no other logo on the candle. The wax was pure white with one perfectly centered wick. I looked on Aromatique’s website to find a scent description but couldn’t find one so I’ll try and describe this scent as best as I can for you. First sniff… it smelled like a classic vanilla extract. Not the sweet bakery kind but a classic pure vanilla. Just like the name. Smelling the wax, the scent was not strong so I’m hoping it really comes alive once I start burning the candle. That happens a lot and not unusual. Time to find out!! True and classic vanilla’s (for the most part) give off subtle aromas so I decided to test this candle in a small room to start out… and I ended up leaving it there. The fragrance after a good few hours stayed pretty subtle and the aroma didn’t travel outside the bathroom I had it burning in. That really is unusual for an Aromatique candle but I think it’s just the nature of some vanilla fragrances. 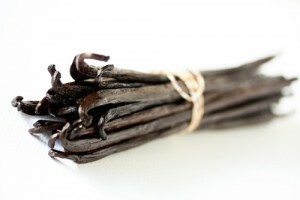 The fragrance itself was an absolutely pure and creamy vanilla. Not sweet, not bakery… just a nice and classic vanilla extract. My candle burned perfect. Zero issues. The wick did mushroom after a few hours of burning so I did have to trim that once a day but that’s pretty normal. The candle achieved full melt pools so no wasted wax and very clean burning. A+. I enjoyed this candle and it was really pretty to watch burn. Even though we live in a day of vibrant colors when it comes to candles, I still love burning pure white candles to watch them glow and this candle glowed quite beautifully. It also burned fairly slowly so you definitely get your money’s worth. This candle lasted well over a week and that was burning it every day, all day. I am a vanilla lover, it‘s definitely in my top 5… and mostly of the bakery sort but sometimes it’s nice to experience a classic and pure vanilla and this fragrance was spot on. It was pretty light (aroma wise) so I would stick to small rooms when burning this fragrance and that goes for all sizes. That would have been my only wish… that it would have been stronger. I do recommend it though if you like your candles lightly scented and are after a true vanilla extract… this candle is definitely it. I love Aromatique… definitely give them a try when you want to experience luxury but with affordable price tags. Even though this fragrance was lightly scented, I still rated it a 4 star. Every aspect of this candle performed well aside from strength but I have to take into account many vanilla scents are by nature light. In this case, I think that applies to this candle. Have you tried Pure Vanilla from Aromatique? Review it with us. In the comment section below, review and star rate your experience… it’s easy! Pure Vanilla from Aromatique is a true vanilla extract. It wasn't sweet or bakery... just pure and classic. This candle was very lightly scented so keep that in mind if you're interested in this one. I liked it but it was definitely on the lighter side. I love Aromatique but this candle wasn't that great for me. Not their best for sure.